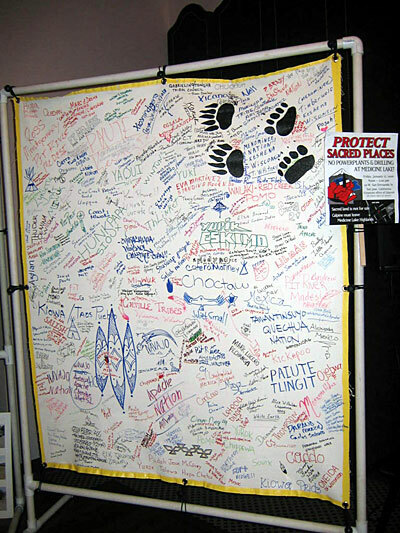 SSP&RIT’s well-traveled banner, signed by over 300 native people, representing their respective nations, tribes and clans. "Our association represents 41 tribes throughout the State of California. A major part of our efforts are to promote the protection and preservation of burial sites, historical and cultural areas of California tribal people. Sites such as the Glen Cove Burial site represent significant historical evidence of our people being present on this land for thousands of years. It is without doubt that these locations must be preserved in recognition of the culture of indigenous people." "As a descendant of the Mishewal Wappo people, who have been identified as a Tribe who inhabited the area in question. We vehemently and distainly oppose the development of the Glen Cove site. We must stop this atrocity and insensitivity to the indigenous people, no matter what tribe they may be a descendant of. We must preserve and protect for now and the future." "The Pit River Tribe is a Federally Recognized Tribe composed of eleven autonomous bands [Ajumawi, Aporige, Astariwi, Atsugewi, Atwamsini, Hammawi, Hewisedawi, Illmawi, Itsatawi, Kosealekte, Madesi] located in northeastern California. The Tribe acknowledges the Glen Cove Shellmound Burial Site as a sacred site that must be protected and preserved for its historical, cultural and religious value." "The Greater Vallejo Recreation District and the City of Vallejo are currently proposing to develop a park with trails and amendments that would desecrate the Glen Cove Shellmound Burial Site. The Tribe supports preserving this sacred and historic site." "The Tribe acknowledges the Glen Cove Shellmound Burial Site (aka Glen Cove Waterfront Park) as a sacred site that must be protected and preserved for its historical, cultural and religious value." "[SSP&RIT] has been paramount in bringing the importance of the Glen Cove Burial site to the forefront of the public conscience with great strength and courage. I have witnessed firsthand at your meetings the efforts of Indian and Non-Indians alike working together in a common goal of preserving history and it makes me so proud to be a part of this exciting time. The Me-Wuk Indian Community of the Wilton Rancheria thanks your organization for all of the outstanding work that you have done thus far and wishes all of you the best of luck." "The Tribe is in support of preserving this historic sacred site." "…the Tribal Council of the California Valley Miwok Tribe acknowledges Glen Cove Shellmound Burial (aka Glen Cove Waterfront Park) as a sacred site that deserves/demands protection and respect." "The Tule River Tribe Indian Tribe Band of Yokut Indians supports [SSP&RIT’s] efforts to preserve and protect the Glen Cove Burial Site." "The protection of Native American burial sites and other spiritually and archaeologically significant areas, which are being desecrated or destroyed by vandals or development all across the State of California, is an issue of importance to all Native Americans. 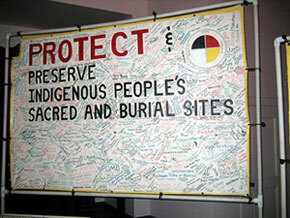 …The Rumsey Band of Wintun Indians supports [SSP&RIT’s] efforts to preserve and protect the Glen Cove Burial Site." "One of the most urgent and important issues at this moment is the protection and preservation of our Native American sites located in Glen Cove, in the City of Vallejo, California…. It is very important that we teach our young people of their heritage and of historical site protection and preservation. If we do not teach this, all will be lost for the future generations to come. It will be as if we never existed. We must protect and preserve what we have now." "The effort to desecrate our ancient burial grounds is the same as the US Government desecrating the Arlington National Cemetery. They would not destroy that gravesite, nor should there be an attempt to desecrate our ancient burial grounds…Speaking on behalf of the Bear Clan, and the Tallige Cherokee Nation, your cause is just, and courageous. May the Great Spirit hear our prayers for you." "We have been studying and protecting natural and built sacred places since 1990 and it is our expert opinion that Glen Cove is a sacred site. 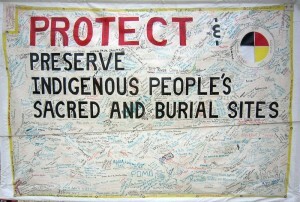 It is a burial site and just like other cemeteries it should be respected in the manner that is culturally acceptable." "As a resident of Glen Cove Landing, I am totally opposed to the City of Vallejo’s proposed park on a Native-American burial ground and historical site. The bottom line is: The area of the proposed park in Glen Cove is sacred to many, and historical to us all. It should be left in its natural state." "This sacred site in Vallejo offers so much for the City of Vallejo. It offers an opportunity for the city to embrace a very unique place and show that it respects and preserves the history that took place at this site…I call upon the GVRD to find an amiable solution. As someone who works closely with the Native American community in Richmond, I would be happy to be a part of a meeting to include the Sacred Site committee, the GVRD, and the Native American Heritage Commission Board (in Sacramento). " "…developing this sacred site with its historical and cultural significance as well as disregarding the grave sites of the ancestors of particular groups of people would be a travesty and an intolerable mistake…I strongly support the preservation of this sacred land." "On behalf of over 500 local area residents associated with the Solano Peace and Justice Coalition, we request the Greater Vallejo Recreation District and the City of Vallejo respect, preserve and protect this culturally and archaeologically sensitive area which is considered sacred to Native Americans." "If this desecration goes ahead many people throughout Australia and the world will be disgusted with the ongoing abuse of Native Peoples’ by the United States. It is time to respect the wishes of the original peoples of California, after destroying most of their sacred sites surely you would have enough decency to save Sogorea Te for future generations." "For too long, other interests, both private and commercial, have superceded those of the Native Americans in the development of our communities. It is past time to hear the hearts of the indigenous people and consider their needs. The cause at hand is more than commercial. It reaches deep into the culture and history of the original people, touching the very nature of their existence. The sacredness of burial grounds cannot be overestimated. The ancestry of a proud people lies beneath the soil, eternally connected by the Circle of Life." "I am writing to urge the Greater Vallejo Recreation District to take immediate action to provide full protection for the Glen Cove Sacred Site in Vallejo. As an organization concerned about the protection of the environment, health and Native cultural and sacred sites, Greenaction urges [GVRD] to truly protect this area." "I am requesting that the Greater Vallejo Recreation District respect the rights and wishes of the First Peoples of Vallejo and immediately stop all development at Sogorea Te. In addition, meaningful consultation with the Vallejo Inter-Tribal Council and other local Tribes and Indigenous Organizations must be initiated at once. A people’s culture is its life and its survival- it is essential that these rights of religion and sacred space be upheld." "We support self-determination of indigenous peoples and Sovereignty for Native nations….and we call for stopping destruction of sacred burial sites. " "The Diablo Greens would like to express our strong support for the preservation of the Glen Cove Burial Site and other important native sites. This site, that dates back 3,500 years, must be protected from development. Sites like this are vital not only to the descendants of the tribes that created and used them, but to every resident of our county." "We have a rare opportunity here to step up and make a difference that will enrich generations to come by setting aside this small piece of land to keep it in a natural state so that those who wish to give it the reverence it deserves can come and offer prayers…"
"After [Wounded Knee DeOcampo] took me on a walking educational tour of the area I left with a full understanding and respect for the Native Americans position. I suggest anyone interested should do the same. Why don’t they use that $1.5 million they have to maintain the parks already built? If this is the way GVRD spends tax dollars it can count on not getting my vote for any tax increase now or in the future. " "The West County Toxics Coalition supports the…demand to save the sacred sites at Glen Cove. The native people have suffered enough." Valerie Stanley, VC, Intertribal Sinkyone Wilderness Co.
How is it possible to allow ANYONE to dig up one’s ancestors remains, let alone remains that are thousands of years old? Are Native Americans allowed to go where White people are buried and dig those cemetaries & graves up? Why doesn’t the same protection apply equally? There ought to be a Law against this action. Well, there IS a Law against digging up this kind of burial site. The City of Vallejo & GVRD (Greater Vallejo Recreation District) ARE proceeding to become Law Breakers. Can they be arrested by a Citizens Arrest if the police won’t arrest the Mayor, the Contractors, and the heads of GVRD for breaking the law? A broken law is a broken law no matter who does it. Maybe we should demand the Mayor be arrested as he does know that this is a burial site. People from all over the world are supporting you in spirit. We have received information from the Vegas ‘Peace Dignity Respect’ via their facebook-page that soon the Glen Cove Ancient Burial Site will be visited by bulldozers, with an urgent question to us to ask you to stop this violation of the sacred ground of the Native Americans. The Native’s tribes have taken care or the land for thousands of years, respecting the land, respecting the nature and respecting their passed loved ones. Their knowing of the unseen worlds, invisible to us white men (who often are even denying the existence of the Spirit World) has influenced their lives and their way of living in respect to Nature all these centuries. The fact that we, so-called ‘modern’ people, aren’t aware of this, should not be a reason to allow destroying, or even disturbing, their sacred grounds, which are, in a way also our sacred grounds. In these matters we simple have to follow their guidance and listen to what they have to say. This is such a moment in which you can make a difference! Therefore we ask you to think this plan all over. Don’t let money or even already signed contracts with companies be your guide when you know it doesn’t feel right. Please dare saying ‘no’ to stop this. Wouldn’t you be furious if the graves of your passed mother or father, or who knows… maybe your burried son or daughter would become part of a tourist attraction?? We would be very grateful if you could help us respecting our ancestors. NC Kituah mounds for Gas exploration, Wounded Knee for whatever, now Glen Cove. Where does it stop. I see a lot of comments on here about the “white man”. Not everyone who is pushing to desecrate ancestral burial sites are white. That sounds racist. But I do agree this needs to end here and now. Any ancestral burial site needs to be protected by everyone. These are all our ancesters at stake. Uproot one you uproot all who are still trying to find there ancestors. 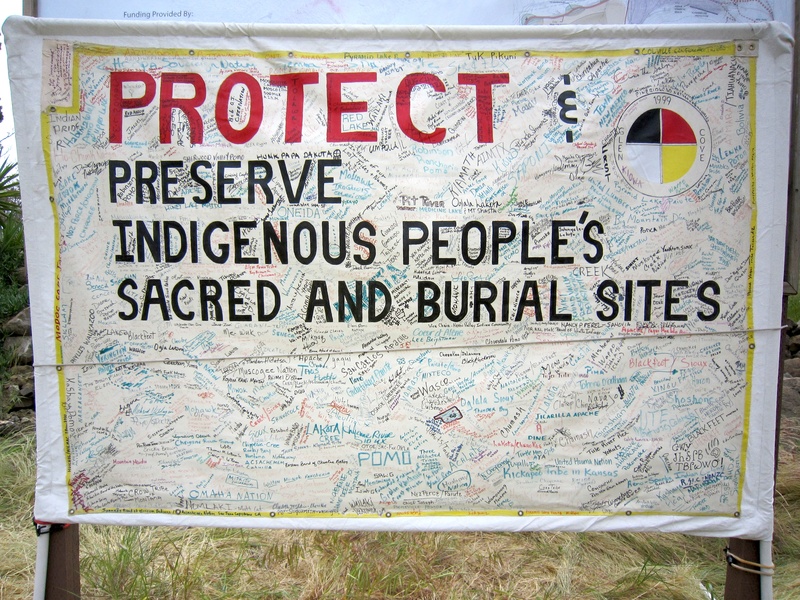 Leave our ancestral burial sites alone and find another place to dig. Don’t fix what is not broken. This place is not a park it is a sacred meeting place for all Native Americans who choose to celebrat their ancetry there at this site. So don’t treat it like a playground or toilet or parking lot. LEAVE OUR ANCESTORS ALONE AND LAY IN PEACE. !! !GLEN COVE RESIDENTS – PLEASE READ THIS!!!! You posess all of the power to stop the desecration of these sacred grounds. If you have never been to the area, please go. You will see that the area is enjoyed by many AS IS. It is our property tax money that pays for this “park” to go in and our property tax money that pays to maintain it. There is a reason your property tax statements aren’t itemized. Get an itemized statement and see how much of that money goes to the Glen Cove Special Assessment. Indeed, if the park goes in, it is YOUR park. Do you want YOUR park build on top of sacred, and desicrated land? Can your household afford to pay for the tax increases to maintenancing it – water, power, sewer and garbage removal ALL cost money. Money Vallejo doesn’t have, money you don’t have. Please go visit the sacred site. All are welcome and the Native people are very gracious to visitors. After you visit, please let your voices be heard. Your money pays the salaries of the people in charge of this. Why is City of Vallejo insisting on digging up lead contaminated soil which are the findings of the EIR to put a toilet and a parking lot on a sacred burial site? This will also corrupt the creek that flows thru the sight causing harm to endangered species such as the California Newt and other endemic flora and fauna of this area? The EPA should not be allowing the disturbance of the creek. – Former Registered Environmental Health Specialist/US Air Force Veteran/Retired Public School Science Teacher. Please do the right thing and consider saving Glen Cove sacred burial site from being desecrated and destroyed in Vallejo by bulldozers and placing toilets and a parking lot on top of the ancestors buried there. How would anyone feel if toilets were built on top of their family’s final resting place. There already is a park in place with toilets just a few blocks away. Glen Cove is beautiful and serene just as it is, and Vallejo residents already enjoy it as it is with the nature and history surrounding it. Vallejo has filed for bankruptcy, so please reconsider what message is being sent for bankrupt Vallejo to spend $1.5 million on building toilets and a parking lot on top of a sacred burial ground. There is a huge public outpouring of support from around the world and from the tax paying residents of Vallejo to save and protect Glen Cove as a sacred burial ground. The Great Pyramids, Stone Hedge, and other sacred places are protected and admired from people all over the world, and here you have a sacred site with cultural and historical significance in Vallejo. Please do the right thing and act with common sense and decency. It is disturbing that in this century in Northern California, a local government would be so clueless about the importance of preserving aboriginal sites of any kind, above all a burial ground. I speak for myself as a Choctaw Nation citizen from Oklahoma who’s lived in the Bay Area for almost 40 years. I appeal to you to understand as human beings why this important to all of us in the American Indian community and to enter into respectful dialogue with those in whose territory you now live and come to an honorable resolution of this dispute. Please don’t repeat the mistakes of the past. Ask yourselves seriously: would you have made this decision if this were a European immigrant graveyard? I don’t have any money to help, but I am willing to lay down in front of a bulldozer or help with whatever means necessary to prevent further harm coming to the Sacred Site. I hope someone in the chain of fools will wake up from their delusional overlord mindset, and become human and humane once more. The whole idea is vile and despicable. I urge the police as individuals and as human beings to have a conscience. Unjust orders should not be carried out. Just find something else to focus your time and attention on. I don’t think desecrating sacred land would be where taxpayers want their money spent when Vallejo has so many concerns that need to be addressed. I am writing to plead with you to consider Glen Cove a sacred space and allow it to remain as it is- a historic and spiritual burial ground of a people who originally inhabited this land. I know that this country has a painful history with Native Americans and I would hate for Vallejo to be another chapter in that history. Though I pass as white, I do have native american ancestry and it hurts to know how much of that culture has been lost. I hope you will do the right thing in this situation and allow the local Native American tribes sovereignty over the few precious lands they have left. Today on 5.10.11 my Grandmother and I visited the camp. 🙂 My English teacher is a Kickapoo Native American. She is from Kansas. She printed out a four page news article about the Glen Cove burial site. She visited like I did. I’m really shocked to see that people want to build a park over someones grandmother. I don’t see why the city just cant leave it alone. It isn’t like they took care of it threw the 10 years I have been going there. I don’t think that the people that plan on building the park realize that peoples family is buried there. I sure wouldn’t want a bathroom buried on my grandmother, or sewer lines running through her grave, or kids playing and digging where she lay in peace. I picture it as a cemetery. That’s what it is isn’t it? After we had left the camp, me and my grandmother were thinking about ways we can help. The best way that we think is to spread the word and have people visit and do as we did. Thank you Melissa and your grandmother for visiting with us at the fire the other evening ago. It’s great that your teacher is informing your classmates about the Glen Cove shellmound and encouraging students to visit. We welcome your classmates anytime you are able to make it down. Please keep spreading the word! As we members of Academic Workers for a Democratic Union continue conducting a sit-down in this union office to demonstrate our commitment to member participation in governing ourselves, we claim the right to this space, since we are members of UAW 2865 and this is the office of UAW 2865. But we are aware that this building occupies land which originally belonged to the Ohlone people. The legacy of displacement and raw acts of power against the rights of people to decide their own fate is part of all of our histories, and it is our duty to point out and resist those acts wherever possible. If the struggles are for justice, then they are part of the same struggle. To that end, we offer our solidarity with the indigenous peoples and their supporters currently occupying Glen Cove, just up the road in Vallejo. Their right to have a say in what happens to the land must not be ignored. Glen Cove is a sacred gathering place and burial ground that has been used by numerous Native American tribes for well over 1000 years. No matter how much supporters of so-called development use words like “improvement” and “preservation,” any action that does not put first the interests of the people still here, who have been connected to this land since before this country existed, is illegitimate. Indigenous people have seen fit to protest the current plans for development, which includes such insults as putting toilets near burial grounds. They have put their bodies on the line and on the land, and we support their demands that the resting place of their ancestors be respected. Osiyo, There are things in this life that are very Sacred, and one is our Sacred Burial Grounds,Just because we are Indigenous People, doesn’t mean we don’t exist, we are real and we are still here. Why do you think you have the right to Desecrate our Sacred Grounds. They are not your Ancestors, they are our Ancestors. We are here to stay. You always try to destroy what you don’t understand or fear what you know nothing abought, why can’t you try and learn about these things. We are all as one. We do not distroy your cemeterys leave ours alone. You wonder why we were always at war with each other, that is one good reason.Please think about what you want to do.The Creator does not want you to dig up a Sacred Site,it is Sacrilege. What you do will come back on you 10 times.I have been calling on all people to come together in Peace, how can there be peace with the distruction of our Sacred Sites.I am calling for a Great Gathering to begin. Bill Little Eagle, Cherokee, Manataka. I am so happy to know so many of you who are able to stand as warriors.I also am grateful for the others I have met at the camp.These kind of actions are what true freedom is about.It also shows how much people truly love being connected,tribal life.Aho.All My Relations. Sending you all prayers, strength and love from the Tohono O’odham Nation of Arizona! Like Indigenous Peoples all over the world we too fight ever increasing occupation of our traditional and sacred lands. All over O’odham jewed (land) we are striving to protect our burial sites, mountains and environmentally sensitive lands from occupation by the United States Border Patrol and Economic/Free Trade Monsters established by our sharing of 75 miles of International Border with Mexico. We know that the strength gathered from the basic and true of our cultures and traditions, songs and prayers will sustain us as they have since time immemorial, but also that in today’s time that more has to be done to defeat our enemies. We are here. Please know that we stand in solidarity with the people of Segorea Te and all who protect the land of our Ancestors! Si has em-elid, with love and respect. Never stop defending sacred areas. My heart and spirit is with you all. The sober warriors of the Hupa Tribe (Sweat Hogs) will be praying hard for your cause. We plan on organizing a trip down there to support you perhaps on the 25th of June. Maybe we could bring some willows and blankets and sweat, pray and sing together. It is so important for all peoples to pull together and act as a unified team to show the strength of protecting sacred sites and traditions! As a Northern California native I am proud to live in this part of the country. There are many places that are sacred among our people. Many customs that we practice today that have not died in vain as some would hope. I went to a funeral today of a close friend and family and one of the elders I spoke to said something to me I thought was very profound. She said that we should walk gently on this earth and not make many enemies as we may make someone angry at us and that person may have to bury us. She then proceeded to chuckle and I began to think, how wise this humorous story struck me. I’m am not surprised at the horrific news of the leadership of Vallejo wanting all of the world to turn their backs as once again the foreign mindset of destroying something they know nothing about for what always seems as financial gain. What they don’t understand yet is the long term effects and consequences of desecrating our elders. Look around you!! Wake up and realize that any race that can live in this land for 10,000 plus years and keep it as beautiful as you found it had some discipline and rules. A burial site such as this was at the edge of the water which is sacred in itself. Some elders had to travel four days to get to sogorea te which is also a rule. Last I heard golf courses aren’t doing so well why not build some toilets over on the golf course. The indigenous are not asking for all of Vallejo back yet. Just perserving these burial sites which are sacred to our people. The bible your ancestors wrote awhile back mentions that you reap what you sow. So consider stopping the insanity of destroying your own future on borrowed land because you do not own any of it…we believe that the land owns us. Respect what is not yours …let our Elders rest…. My heart and spirit have always been supportive of you. There are many kind, decent and compassionate people in Vallejo who offer the same support. Do not be swayed by the handful of hateful, insensitive souls. Your comments echo the gentle, sensitive feelings and respect I have experienced every time I have visited the site. There is and continues to be, nothing but a peaceful spirit of love and pride exhibited by the people demonstrating there, for the sacred land your ancestors are buried on. I have absolutely no regrets for supporting the people protesting the building of toilets and parking spaces on Native American burial ground. I also find it odd that the formally designated tribe only spoke up now. I once said I am a person who has the courage to stand behind my beliefs. Just because an issue is controversial or unpopular with some, will not cause me to withdraw my support of it. That’s right I now own it and I am proud to do so. God will continue to watch over and protect you and your supporters. You will prevail. I am a specialist in the archaeology and ethnohistory of California Indian societies. The San Francisco Mission records indicate that the Carquin and the Huichun-Aguasto Ohlone groups lived along the Carquines Straights. The area is also immediately adjacent to the Napa Patwin tribe in the Vallejo area. The Carquines straight also served as the waterway that united the Coast, Bay, Plains and Sierra Miwok groups who were important manufacturers and traders in Central California. The Carquines Straight is the passageway through which all streams drain out of California’s Central Valley. The Spanish explorers saw Indians in boats catching Sturgeon with nets in the Straights. The settlement site at Glen Cove is an important Californian site and should be protected. Heritage sites such as the mound at Glen Cove are unique and can not be replaced. Unlike trees that can be replanted, there is no way to put a site back together once it has been disturbed. Even the best intended development work at a site usually entails more disturbance than initially intended; because planners usually don’t anticipate the disturbance that occurs when site deposit is removed to place base material for parking lots or during excavation of utility trenches. The site should be protected by avoiding soil disturbing activities in site areas. After spending the past week at Sogorea Te, and some time researching past and planned developments for Glen Cove, it seems appropriate to communicate the following. It is a matter of public record that tribal peoples inhabited Glen Cove and that a shell mound, cultural materials, and burials remain on the land. Since 1907, the scientific community has been aware of the existence of the indigenous occupation of Glen Cove. 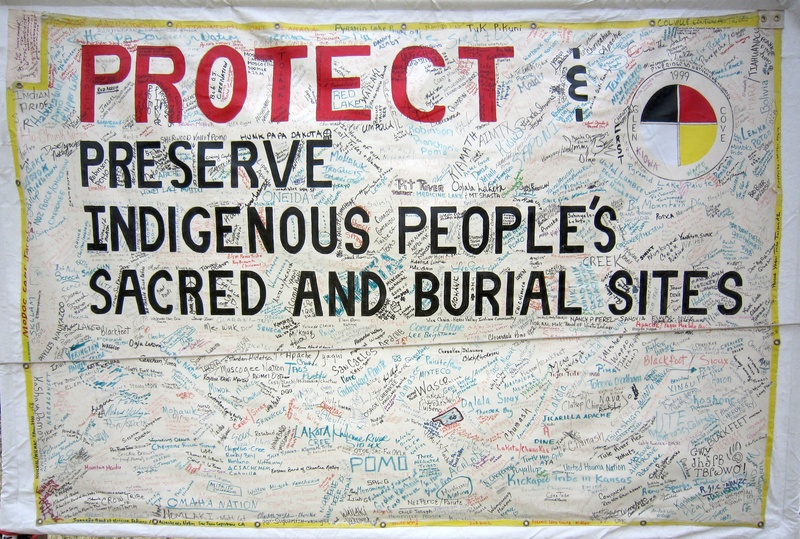 In 1986 the Vallejo Times Herald noted the discovery of a Native American burial in Vallejo and quoted representatives of both the California Native American Heritage Commission and the State Office of Historic Preservation who agreed that to disturb burials, and other evidence of ancient places was to destroy history, to displace what is irreplaceable and invaluable. Too bad that those interested in and/or having some responsibility for historic preservation over the past 100 years have not taken the opportunity to ensure that history, intact, is preserved at Glen Cove. To the uninformed eye, Walden Pond looks like any old puddle. Activists have fought to keep developers and the general public from totally destroying what inspired Thoreau, our great green grandfather. While many Americans, of my generation at least, learned a lot about Thoreau in public school, we didn’t learn much about Indians. History started with Columbus, jumped to the Mayflower, jumped to George Washington, jumped to pioneers, jumped to the Civil War, and kept on jumping forward in time, never looking back or even sideways, as we claimed “our” history without question. The learning curve may be steep right now, but follow along and don’t pretend you’re a pioneer. The Greater Vallejo Recreation District jumps into Glen Cove with its current plan to make “improvements” for the benefit of the good citizens of Vallejo. Most of Vallejo’s coastline has already been improved to the exclusion of wildlife and vegetation, but the GVRD wants to add a paved parking lot with restrooms and paved trail, bulldoze a meadow, and uproot trees and other plants. Since the GVRD’s prior plan to lease the old “historic” Stremmel mansion on the cove had no takers, they now want to bulldoze that as well. Downtown Vallejo has many great old mansions, it has no other shell mound. Vallejo has public parks with restrooms, in need of maintenance and better security. Because we all have personal obligations, we allow officials to make bad public decisions for us. If the GVRD really means to improve Glen Cove, then it must abandon its plan to destroy it in the name of the good citizens of Vallejo. A visitor to Glen Cove will see ducks, geese, skunks, fishermen quietly waiting for a tug on their lines, a man kayaking, people walking with their children and their dogs. One can stop by the prayer vigil, share a meal, and learn some history from those standing between their ancestors and the bulldozers. If we can simply agree that we enjoy a quiet natural spot with a clean beach and well-maintained trails, and that we can best respect the history of Glen Cove by not bulldozing its shell mound and burials; then we can be both inclusive and protective of our shared spaces and humanity. We can and we must. I respectfully ask and pray that you CONTINUE to progress a course of action to conserve the Ohlone-Karquin pre-historic shell mound village and sacred cemetery area of Glen Cove/Sogorea Te at the Carquinez Strait waters. As a council member, you know, your protective action to date is clearly in concordance with State and Federal laws. As good patriotic Americans, the City Council now has this short time in world history to contribute to the common heritage of humanity. I pray you will embrace the generous ‘cultural easement’ concept proposal from the tribal allies of the Ohlone Native American descendants. Undoubtedly this sacred burial and trading place is of outstanding cultural importance for future generations. The cultural easement can be the next step in a respectful progression to conserve this sacred place in world history. This may be the last least disturbed massive burial shell mound of those 400 that ringed the S F Bay, inventoried by Nels Nelson in 1907 (Sol-236). We trust you will continue to value our history; then our nation can proceed to nominate Sogorea Te of “outstanding universal value” to inscribe on the UNESCO World Heritage Sites. A “cultural easement” can be legal, consistent and practicable for the City of Vallejo’s mission. Would it not also be practicable to form an ongoing working group that invites Congressman Miller, State Senate and Assembly Members to an open dialogue with the Native Americans and non-native people who are attempting to “save” Sogorea Te from danger? The Mayor of Richmond has offered to work with you; undoubtedly other experienced colleagues would offer to participate. Considering religion: The 1978 American Indian Religious Freedom Act requires policies of ALL governmental agencies to eliminate interference with the free exercise of Native peoples to believe, express and exercise their religion– and to accommodate access to and use of religious sites to the extent that use is PRACTICABLE and not inconsistent with an agency’s essential function. Considering both history and religion, my two granddaughters learned in Vallejo’s schools that this lovely place was an Ohlone people’s village at the confluence of rivers and the Bay, a strategic trade route where ancient peoples from all over the West Coast of the USA gathered together centuries before the arrival of the Europeans–before any factories, houses, roads etc.. The children’s classes visited Sogorea Te and imagined how the thousands of Karquin-Ohlone Indians buried there had lived in past centuries. They learned of the religious ceremonial rites from local Native American speakers. They read historical accounts by the Spaniards, Mexicans and historians that described ceremonial gatherings of visiting tribes, the significance of the plentiful salmon and huge sturgeon in the Karquinez Strait, and the plants the Indians harvested for food. You likely have heard the fascinating legend that when the salmon ran in droves one could walk on the backs of those gleaming silver fish across the water. Indians could scoop up fish by hand from a canoe. This interested the children to gather reeds and make a 1/3 sized canoe that hung in the classroom for all to see–they wrote poems, drew nature scenes and imagined hundreds of years ago they were living at Sogorea Te. They gathered acorns and made acorn meal cakes–imagining they were Ohlones. They wrote on the arrival of the Spaniards, the settlers taking the land–the painful story of the Indians being removed to forced work at the Missions–breaking their culture into pieces–and the 20th Century Human Rights efforts on the restoration of Indian culture. Besides knowing bits of the (archaeological) historical record of Sogorea Te as a community trading village, schoolchildren all over the Bay Area wonder how Native Americans lived, died and were buried there by the water beneath the mounds of shells. Thus, doesn’t this public land belongs to ALL our children and their children’s children? Recall that former Mayor Gloria Axline asked local community leaders to value letting the dead rest and to ‘keep quiet’ for fear of grave robbers who pull out Indian bones and funerary items to sell on the international market. Perhaps the Council will formally commend the volunteer Protect Glen Cove prayer vigilers for providing 24 hour security? I applaud your ongoing protection of the 15 acre public land Glen Cove burial site from intrusion of a local bullish ‘parks’ agency who disrespect laws that protect religious practices and threaten to violently dig, bulldoze and move soil that will erase our heritage forever–it cannot be replaced. In conclusion, do ask our children–they know the ugly painful history of Native peoples will say NO MORE Indian bones should ever be pulled out of the ground just as the soil of the graves of our grandparents–our ancestors should never be disturbed. Please support the concept of the Glen Cove Cultural Easement and continue your good work. I was contacted by Chief Swamp Rat and asked to try and help you with this atrocity against our people. I started emailing this morning and have been informed my email/your story has already reached 30,000 + individuals, been posted on one Native American site called Land Rights N Farming who have a 68,000 + subscribers, has been posted on 5 international sites, and one contact has placed your story and prayer for victory in the Wailing Wall in Jerusalem. Ive also contacted a news site called Forbidden Knowledge who specializes in suppressed news and alerted them to this with Brother Wounded Knees phone number, and when Im done here, will be contacting the other CA reservations for Brother Wounded Knees c all for help. So this day alone over 100,000 more people have been told of this sin against us all and called to help, by the end of the week, half the country should know. So please know you are not alone!! May The Great Spirit bless you and your familys this and every day! I am writing to show my support on behalf of myself and The Red Nation Society (TRNS) to speak against the desecration of the Native burial ground and ancient Native settlement in Glen Cove, CA. We are outraged and want this to STOP. TRNS stands behind you in your fight for our people. Our members are doing all they can to help stop this. Please know we are with you in our hearts, minds and spirits. Many blessings to you and may the Creator continue to guide you. This is sacred land. It needs to be treated as such. May the strength of all my ancestors be with you as you sacrifice to proctect this sacred site. I am unable to assist you physically from the other side of this land but the smoke of my pipe will speak to the Great Mystery and he will lean to hear my feable voice, as he heard those before me. Stay strong my friends and receive my strength. I give it freely. Make a loud voice together and stand firm your ground, this cause is our cause. I have spread word and signed the petition. You have my support and I hope that this land will regain the respect it deserves.